Today's pattern is the Template Method pattern, which defines a stub for an algorithm, deferring some implementation steps to subclasses. The Template Method pattern is used when two or more implementations of a similar algorithm exist. In the real world templates are used all the time: for architectural plans, and throughout the engineering domain. A template plan may be defined which is then built on with further variations. For example, a basic house plan can have many variations such as adding an extensions or using a different heating system. Defines the skeleton of an algorithm in a method, deferring some steps to subclasses. Template Method lets subclasses redefine certain steps of an algorithm without changing the algorithms structure. The AbstractClass contains the templateMethod(), which should be made final so that it cannot be overridden. This template method makes use of other operations available in order to run the algorithm, but is decoupled for the actual implementation of these methods. All operations used by this template method are made abstract, so their implementation is deferred to subclasses. 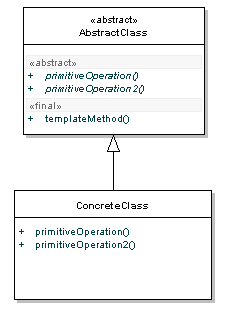 The ConcreteClass implements all the operations required by the templateMethod that were defined as abstract in the parent class. There can be many different ConcreteClasses. The Template Method pattern makes use of the Hollywood Principle: Don't call us, we'll call you. The template method in the parent class controls the overall process, "calling" subclass methods when necessary. The Hollywood principle avoids low level components depending on high level components, and instead give these low level classes (ConcreteClass) a way of hooking into the parent class (AbstractClass). Concrete methodsStandard complete methods that are useful to the subclasses. These methods are usually utiity methods. Abstract methodsMethods containing no implementation that must be implemented in subclasses. Hook methodsMethods containing a default implementation that may be overidden in some classes. Hook methods are intended to be overridden, concrete methods are not. Template methodsA method that calls any of the methods listed above in order to describe the algorithm without needing to implement the details. When Would I Use This Pattern? You want to control the point that subclassing is allowed. Template Method may not be an obvious choice in the beginning, but the usual sign that you should use the pattern is when you find that you have two almost identical classes working on some logic. At that stage, you should consider the power of the template method pattern to clean up your code. As you can imagine, use of the Template Method is fairly common. You'll find it used in the Arrays class uses it for sorting. JFrame uses update() as a template method, subclasses of the JFrame use paint(Graphics g) as their hook method. For our Java example, we'll use a cross compiler as an example. First, we'll create a generic cross compiler base class, with it's crossCompile() method being the glue for the whole algorithm to run. There are some downsides to the template method pattern. Firstly, your base classes tend to get cluttered up with a lot of seemingly unrelated code. Program flow is a little more difficult to follow - without the help of stepping through the code with a debugger. Alex Miller provides a detailed rundown of the reasons he hates the template method pattern in his blog. We're going to look at the Prototype pattern later this week.